IMTCA is an organization that has the ideal training and aids in bringing out the best in the horse and rider. 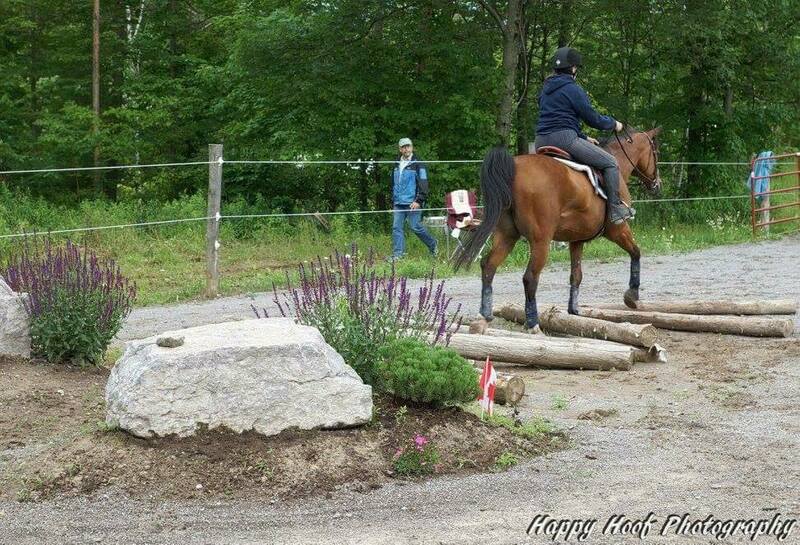 When possible, we encourage the use of natural obstacles in training and shows. 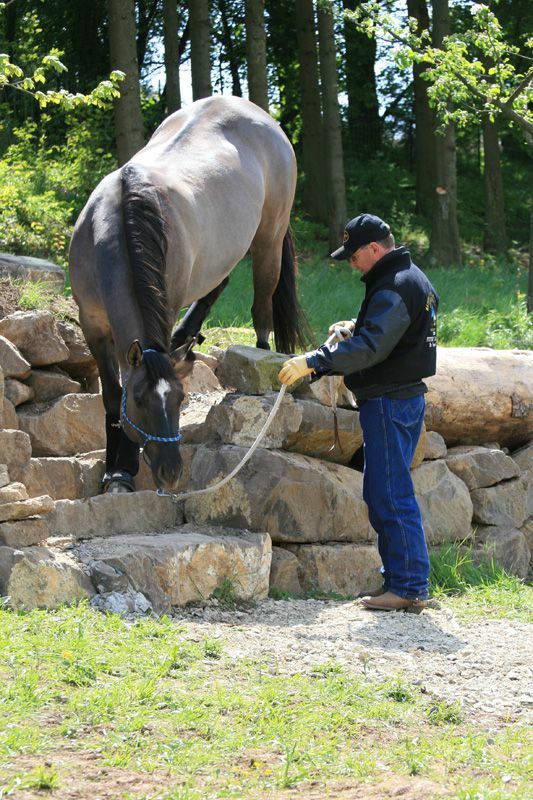 We encourage manmade obstacles to be constructed in such a manner as to protect the safety of the horse and rider. 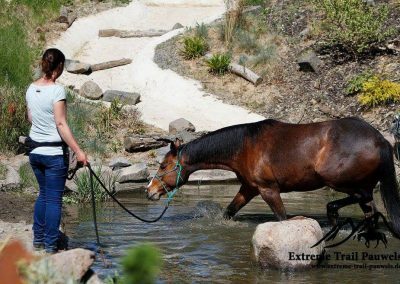 IMTCA will use this new sport as a way to build the horse and rider into a partnership that exemplifies great horsemanship where the most difficult mountain trail can be navigated in a safe manner. We want this sport to showcase the ideal Mountain Trail horse, and where a rider of any skill level can enjoy trail riding in a safe manner. As this sport grows across the globe it is necessary that clear, consistent and unified judging rules apply in all venues. It is a major function of the IMTCA to compile and continually update the rules as needed. We wish to insure that the rules cover form to function, and serve as a practical learning tool for use on the real mountain trail. IMTCA will do everything to encourage proper “trail attire” for participants in Challenges and shows. 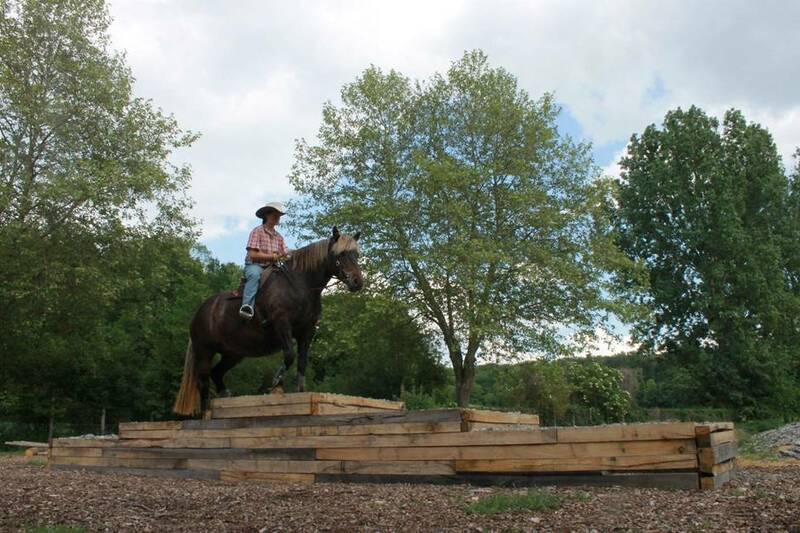 There have been a number of training courses built over the years but Bolender Horse Park was the first ever facility to be built specifically for full-time training in Mountain Trail and Extreme Mountain Trail on a year round basis. 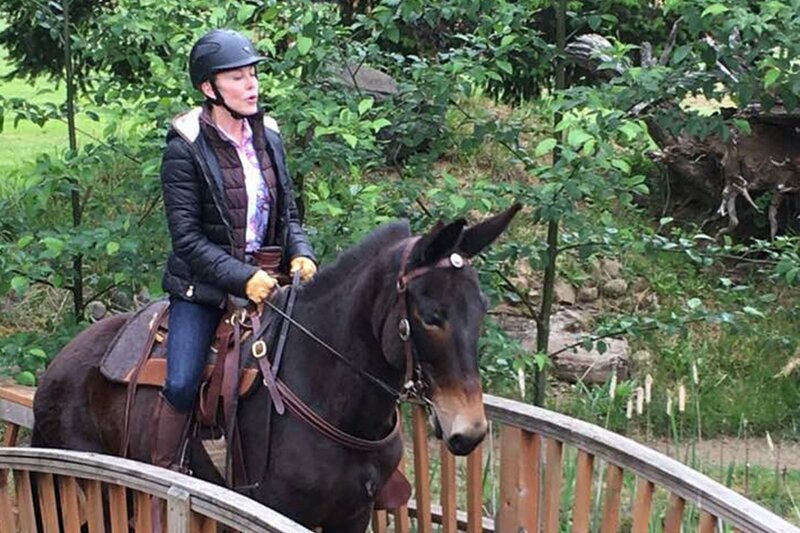 Unlike many disciplines, every breed of horse and mule can participate in mountain trail. 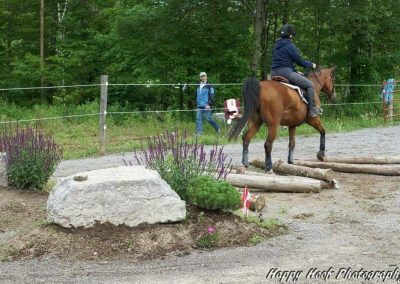 Riders range from Olympic competitors to those who are just starting with their first horse; from youth riders to those in their 80’s – all are having fun. You can see riders in every type of saddle – dressage, jumping, roping, equitation reining and endurance. Clinic participants come from every walk of life, yet when everyone comes together they are one in their passion to learn and in their love for the horse. We look at how this discipline is growing across the globe and how IMTCA will be a driving force to bring unity to judging and conformity to certain obstacles that are commonly used in the challenges and shows. We have been holding clinics and judging Challenges for the past several years and we continue to see growth and excitement. We are so eager to see many more Mountain Trail courses being built around the globe. All have a different feel but each one is good for both the horse and the rider’s mind. Every Mountain Trail course we build is considered “functional art” that is both beautiful and has a practical application. When we design and build a course we bring a background of Architectural Landscaping, construction, teaching, training and being clinical experience. Not only do we want the course to be visually pleasing but we want it to be safe and have multiple levels of difficulty. 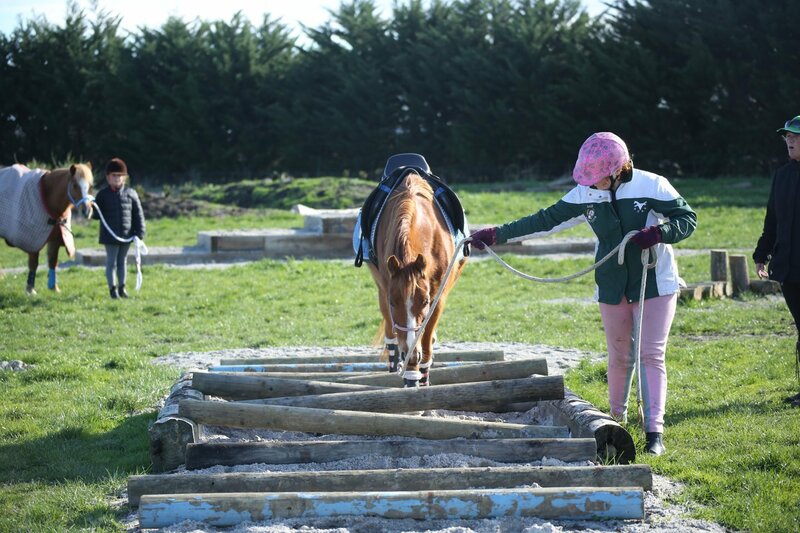 We do not want the beginner to be intimidated but we also want the top-level event rider to be challenged. This is why each course is designed for three levels of challenge. The wear and tear on a course is tremendous so each must be designed to withstand hard use for years to come. Every obstacle must be assessed for safety and durability. For instance, each incline must contain a certain ratio of dirt to gravel; dirt or gravel alone will not hold up and must be mixed. So many considerations go into designing a course such as visual appeal, flow patterns for training, and maximum observability for clinics and shows. We ask questions like “where do the spectators sit and what can they see?” or “were do participants wait before they go into a class to show?” or “Where do the participants of a clinic wait?” or “will the site hold all of the participants?” or “where will the judges sit?” These are just a few of the concerns that must be addressed when designing a Mountain Trail course. Each course also is designed to blend into its surroundings, like part of the natural landscape. Whether it’s built of rocks in Scotland, palm trees in Florida or desert vegetation in New Mexico, it must feel like part of the land. Mountain Trail and Extreme Mountain Trail challenges and shows are fun social events where good horsemanship is practiced. 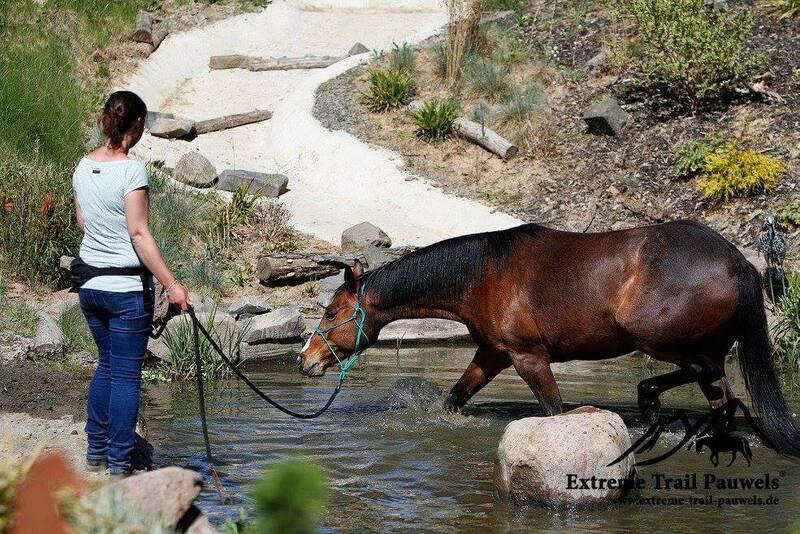 Horses are challenged to navigate through obstacles and riders are challenged to trust their horses in the process. Hence, a true partnership between horse and rider is realized, and every person participating or watching enjoys their journey. A competitive event for Mountain Trail and Extreme Mountain Trail is known as a “Challenge”. 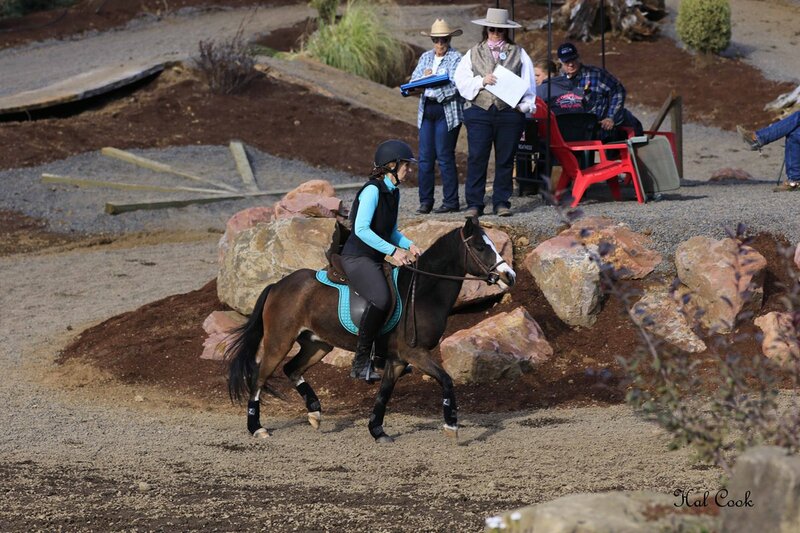 A Challenge or Show will test a horse and rider’s ability to navigate both natural and man-made obstacles in a safe manner and with technical skills that demonstrate great horsemanship. Each show will have three levels of difficulty that are designed to challenge but not intimidate riders. Attire and tack required for participating must be neat, clean and in good working order. Mountain Trail is a judged event designed to show the confidence, boldness and athletic ability of all breeds and all disciplines of horses, ponies and mules while being challenged by trail obstacles. In IMTCA competition, contestants are required to navigate a course with at least 6 approved obstacles and no more than 16 as set forth in the IMTCA Rulebook. Mountain Trail requires navigating obstacles at a walking pace for the lower levels. 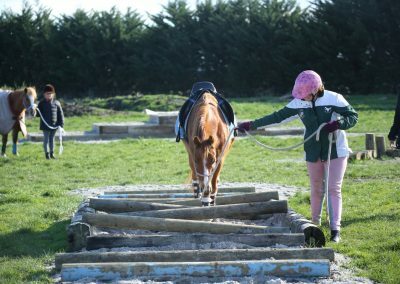 Navigating between obstacles at a faster pace; trot, lope, canter; is reserved for the more experienced horse/rider combination in the higher levels. The combination of loping, cantering, trotting, jogging and/or gaiting makes this sport move along at a faster pace than that of arena trail classes. The horse and rider should be able to willingly assess and enthusiastically navigate new obstacles with finesse and in a safe manner. Mountain Trail has flourished and expanded over the years in the USA, Australia, Canada and Europe. Challenges and events are now held in all of these locations. The IMTCA Executive Committee will be aligned with other worldwide equine associations to accomplish common goals and to continue to expand the sport of Mountain Trail into the international arena. 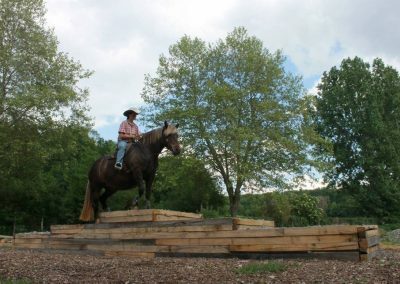 Standardized man made obstacles and a common rulebook makes the competitions/challenges equal worldwide to showcase the perfect Mountain Trail horse. Perfection is epitomized by a horse that is bold, confident and moves forward in a natural gait that is safe and also covers ground as if it were on a long day’s trail ride. Even though each course is unique to its location wherever that might be the challenge for the horse and rider is the same.